Bet your friend that you can link together two paperclips without touching them! 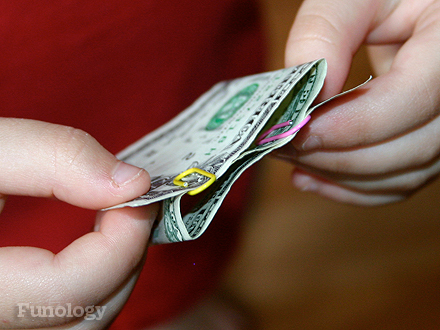 Fold the dollar bill in thirds and use the paper clips to clip two of the three layers of paper near the open end (see picture above). Grasp an end of the bill with each hand. Quickly pull the ends apart. The two paper clips will fly into the air and will be linked together when they land!